This Silencer Mounting Flange allows for fitment of all TYGA silencers to any stainless steel two stroke expansion chamber. Simply cut off the original mount flange and weld on the TYGA mount flange. 26.5mm inside diameter. 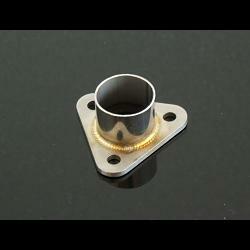 Some expansion chamber systems may require a reducing sleeve, or modification to the mount flange for the perfect fit. This is a replacement part. When ordering chambers (EXCS-****), this item is included in the price and you do not need to order this parts separately.